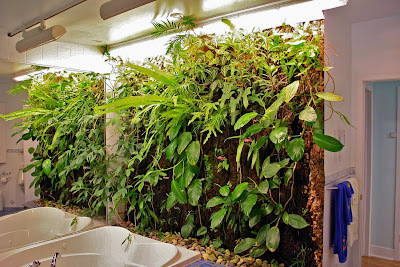 Some of you were pondering the possibilities of a vertical garden at home; as promised, an image provided by garden writer and houseplant expert Larry Hodgson of his bathroom. Other Ellen and and I have been invited to see Larry's creative work in his home in Quebec Province, Canada, but so far haven't been able to take him up on his offer. Now that I see the picture, I'm holding out for an invitation to bathe. Double click on the image (and any other images on Garden Bytes) to see an enlargement and hunt for the two small flamingos that Larry added this year. Note the array of grow-lights that make a permanent installation possible. Larry Hodgson, a talented garden lecturer, author, trip leader and raconteur is the author of many books, including "Houseplants for Dummies", "Decorating with Houseplants", and "Your Guide to Healthy Houseplants". My favorite of his books is "Making the Most of Shade", Rodale Press, 2005 to which I refer time and again for inspiration, information and his strong opinions. I would love to know how this was created. i just want an invite to bathe as well! Are you sure you'd want to turn your back on some of those plants??? ;-) ha. What a beautiful idea. Thanks!